Hong Kong, also known as ‘the +852’, is the remarkable city that effortlessly fuses Western influence and Chinese heritage. The everlasting sea of neon lights shine beneath a skyline reminiscent of Manhattan. It is vibrant, yet there is another side to Hong Kong that very few encounter for one reason or another. A side that is tranquil, undisturbed and seemingly forgotten by the masses. The green side of Hong Kong. With 78.7% of Hong Kong’s land mass being ‘vegetated’ (grasslands, woodlands, shrublands and agricultural lands), there are endless paths of discovery waiting just moments from your doorstep. Get off the beaten track, over the rolling hills and see what is waiting beyond the next corner. Avoid the travel guides and listen to the whispers you have heard - you never know what you will stumble upon. Perhaps you will uncover a gem - just like I did. 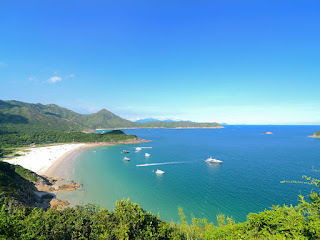 an area to the north east of Hong Kong has an endless supply of beauty. Here you will find pristine beaches with pearl white sands and serene turquoise seas - something not out of place in Thailand, Cambodia or Vietnam. Ham Tin Beach is a place I never thought would exist when I first landed in Hong Kong. It’s the ideal camping spot where just metres from the rippling shores you can sit back, relax around a campfire and sip away on a beer (or two). The clear skies invite you to gaze upon the stars for hours whilst the temptation to take a dip in the placid sea is all too much. It was, however, the next day that I really discovered Hong Kong by foot. Leaving behind friends to nurse their hangovers, I ventured off into the greenery with the hope of running, hiking and climbing my way back to the city. The sense of adventure was all too rewarding as I made my way along the Maclehose Trail not knowing what I would run into. After drifting around Chek Keng Bay where you feel as if you are gliding across the ocean’s surface, I made my way to the top of Ngau Tau Shan. The climb was unbearable, especially with a huge camping backpack weighing me down and the previous night’s excesses sweating from every inch of my body. However, when I reached the peak and had a view as far as the eye could see in all directions, I became overwhelmed with the feeling of joy and accomplishment of persevering to the top, of finding a gem, going off the beaten path and not returning the way you came. Finding the perfect view in Hong Kong isn’t all that hard, but when you stumble upon it by chance, it makes it that much more special.